It was so great to perform each of students . Especially some of student learn from me around 11years who is going to university from this September. 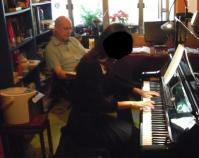 After students performance, I tried to play some of piano pieces by myself. Before today I learned from Japanese teacher and David sensei for my music. Specially he teach me great things . I feel like so getting positive and wanted to be practice more and more. So if some students have opportunity to go to Hong kong , I definitely recommend to learn from him. He is so kind and teach us more relax way . Such a lovely teacher, David! I am also looking foward to see you again soon. When I decide to about Summer School details , I will show you all ! !